The days of Brandon Rios and Victor Ortiz being relevant contenders has long since passed. Both men are former two-division world champions. Both were main-event opponents on pay-per-view. But Rios has not won a relevant fight in nearly two years. Ortiz has not won a relevant fight in over half a decade. But earlier this week, Rios confirmed with Fighthype.com that he would be facing Ortiz in February, with the exact date and location yet to be determined. It is impossible to not get excited about the prospect. Rios and Ortiz may not be relevant at this point. But they have genuine bad blood, that goes back for years, to the start of their careers. 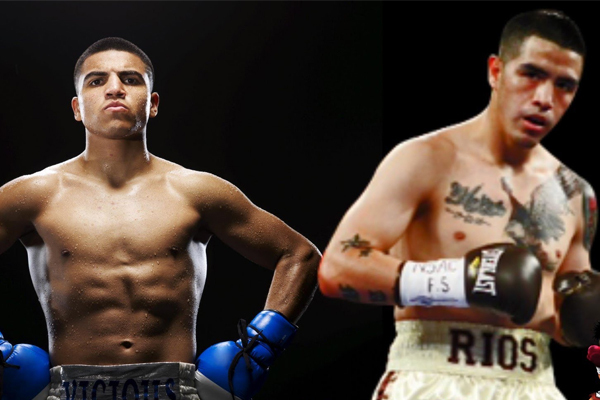 During the time when they were two of the sport’s bigger stars, Rios was promoted by Top Rank and Ortiz by Golden Boy. This was at the height of the Top Rank-Golden Boy cold war, so a bout between the two was never a serious prospect. If this fight happens, I’m picking Rios, without question. Both men are faded versions of themselves, but nobody has ever been able to question Rios’ heart. The same can hardly be said for Ortiz. By the standards of elite prizefighting, Ortiz is mentally weak. He is a front-runner who has always been able to look outstanding against less talented opponents, but consistently comes up shot when it is gut check time. Against Marcos Maidana in 2009, he looked terrific early, knocking the Argentine gunslinger down twice in Round 2. But Maidana is not a fighter with an ounce of quit and he battled back. He hurt Ortiz in Round 5 and in Round 6, Ortiz quit. Ortiz’s most famous moment came in 2011, when he had the opportunity to face Floyd Mayweather on pay-per-view. Frustrated by his inability to connect with Mayweather along the ropes, he threw a flying headbutt that busted Mayweather’s mouth. After being assessed a point for the flagrant foul, Ortiz attempted to “hug it out” with Mayweather and instead got caught with his guard down and knocked out cold. I do not like to see prizefighters flagrantly foul. But there is a reason they say “you don’t play boxing.” I had a lot bigger problem with Ortiz trying to hug his opponent seconds after the flagrant foul. In 2012, Ortiz faced fringe contender Josesito Lopez. Heading into that bout, he was already being tapped as a future opponent for Canelo Alvarez. He started strong against Lopez, but Lopez did not view himself as there to lose. When he dug in and fought Ortiz hard, Ortiz responded with a flagrant rabbit punch. In Round 9, Lopez broke Ortiz’s jaw and Ortiz, once again, quit. Ortiz took off more than a year after the fight with Lopez. When he came back in January 2014, Luis Collazo knocked him out in Round 2. Last April, Andre Berto knocked Ortiz out in Round 4. At least one fan at that bout thought Ortiz had quit again, throwing a cooler of drinks at him as he walked back to his dressing room. At this point, Ortiz probably couldn’t fight anybody besides Rios and still draw a crowd. Rios probably still could. But even so, there is nobody fans would rather see him face than Ortiz. Rios and Ortiz may have hated each other for years. But at this point in their careers, they both need each other.